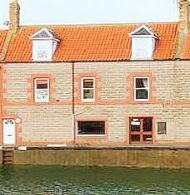 the Herring Queen - a water-front apartment sleeping 4* with views of Eyemouth harbour from every room. If you are looking for a self catering holiday home with glorious views, modern facilties from flat screen LCD TVs with freeview, to latte machines then you may have clicked on the perfect site! The Herring Queen is an listed Georgian apartment within a conservation area, it has been carefully upgraded to maintain its lovely original features while introducing modern day essentials such as a kitchen with all mod cons, and lovely bathrooms complete with power showers and a separate bath. With its walls showcasing local artwork, high ceilings, large windows, stripped pine floors and elegant comfortable furniture, it is a truly exceptional holiday property. Drawing on our experience of renting holiday properties we have put into practice everything that our guests have told us that they want from comfortable beds made up on arrrival with quality linens to not having to worry about the boring stuff like washing up liquid, cleaning materials and washing powder(they are all supplied) .We are mindful also to supply things for adults and children to do in the evening(board games, books, magazines, PS 2 with games, DVDs all in the apartment). Situated right on the harbour there are stunning views of the fishing boats from one of the last working harbours in Scotland. See the boats with their catches, watch the seals and gulls compete for their share and just enjoy the smells and sights of the sea from the comfort of your armchair. Views stretch past the famous Gunsgreen House all the way to the Sea. The Herring Queen is perfect as a romantic honeymoon hideaway for 2 (champagne on ice will be waiting for you) or just ideal for families with the unspoilt beach minutes away and a cupboard stuffed with beach toys and fishing gear to explore those wonderful rock pools full of shrimp, starfish and crabs. Eyemouth is a smashing wee fishing village with its Georgian mansions (now smart hotels with wonderful menus - see www.churcheshotel.co.uk) and alleys and wynds as a backdrop against the promenade. The beach is simply superb, with golden sands and rock pools. Cliffs on one side and the harbour on the other, it is sheltered from the North Sea wind (although the sea takes some bravery to swim in!). All of this with the City of Edinburgh only 40 minutes away and the rolling hills and fields of the Borders surrounding you provides you with an ideal holiday location. *We can sleep up to 8 guests however please email first to see if the sleeping arrangements would be suitable for you- extra charges also apply.